I hope everyone is having a great new year so far. I have started back at a consulting position again (at Clear Winds Technologies) and I'm excited to be back in the consulting arena. I've already been onsite doing some assessments and some troubleshooting. One of the things I addressed was putting a UPS in for a Cisco phone system. This facility has power problems, and while they do have a large UPS in the rack, it needs to have its batteries replaced. So now, when the power goes out, so does everything else connected. That is not good for the CUCM onsite. This server, when its gets a hard power down, usually wont come back up. You have to go through the recover CD to get it back up. So, for a temporary fix, we are putting in a small UPS so that we can go gracefully power it down until we get the big UPS batteries in place. With about a two hour window or so, it gives us some time to get to the server when power does go out to gracefully shut it down (or have power restored). 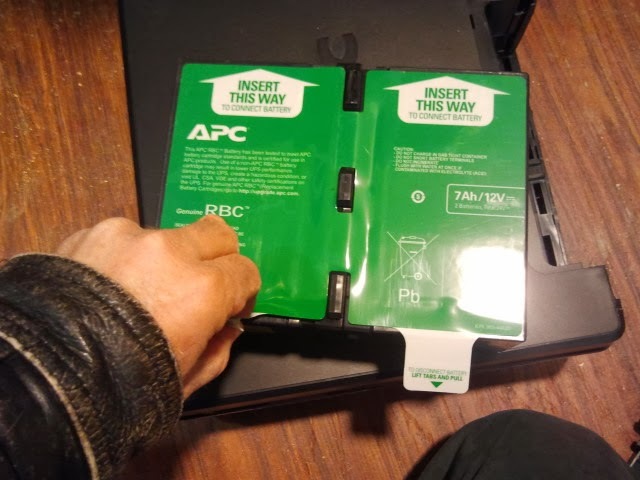 When you get a UPS though, you have to connect the battery manually, which is what I'm doing below in the picture. You cant just put it in and all be OK. You have to connect that battery internally. What Is A Default Route/Default Gateway?